We came across these gorgeous beauties at one of the many nurseries along Sungai Buloh road less than two years ago. There were many plants with numerous colourful flowers that fascinated us so! 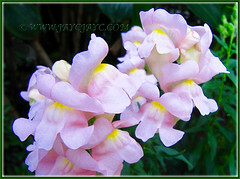 Thus, we happily grabbed a pot of light pink-coloured garden snapdragon that cost us RM8.90 without hesitation. 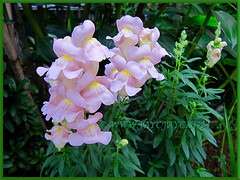 This garden plant is commonly known as Snapdragon due to the flower’s ability to snap open like a dragon’s mouth when its throat is squeezed laterally. Needless to say that it didn’t thrive in our garden for long, probably less than six months due to our ignorance in caring for them. Nevertheless, if opportunity presents itself at a nursery in the neighbourhood, we’ll definitely add the Antirrhinum majus to our garden collection again. 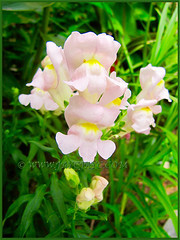 Common Name: Common Snapdragon, Garden Snapdragon, Snapdragon, Dragon Flowers. Family name: Plantaginaceae (previously under Scrophulariaceae). Etymology: The genus Antirrhinum is derived from the Greek words, anti (like), rhis (nose) and inus (of or pertaining to), possibly referring to the nose-like capsule in its mature state. Origin: Native to the Mediterranean region, from Morocco in northern Africa and east to Turkey and Syria, plus Portugal north to southern France in Europe. Also, naturalised in tropical and temperate regions worldwide. Plant type: A herbaceous perennial plant in the tropics and a biennial or annual plant in the temperate regions. Features: Antirrhinum majus is a species of flowering plant belonging to the genus Antirrhinum that consists of about 36 species of flowering plants. A herbaceous perennial that can reach 0.5 to 1 m in height. 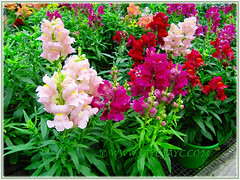 Cultivars and hybrids of Antirrhinum majus are usually classified into 3 groups: short (22.9-30.5 cm tall), intermediate (0.3-0.6 m) and tall (0.6-0.9 m tall). The plants are usually upright-growing with spirally arranged, lance-shaped and glossy dark green leaves that are up to 7.6 cm long and 2.5 cm broad. The showy flowers are produced on a tall spike in terminal racemes. The two-lipped tubular flowers are dragon-shaped, 3.5-4.5 cm long and zygomorphic. The eye-catching flowers of Antirrhinum majus show off their beautiful colouration in both pastel and bright shades of white, pink, peach, lavender, yellow, orange, red, magenta, purple and including some bicolours. 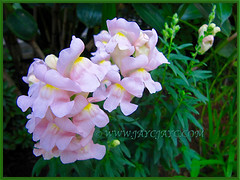 Pollinators of the Garden Snapdragon are the bumblebees. These flowers will be followed by an ovoid fruit capsule, containing numerous small seeds. There are a five subspecies of the specie, Antirrhinum majus. 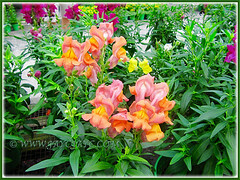 Culture (Care): Antirrhinum majus grows easily with medium care. Moisture: Moderate water needs. Water regularly for optimum growth but avoid watering overhead to prevent rust on plants. Soil: Grow in moist, organic-enriched and well-drained soils. Provide good air circulation. Others: Remove old blooms after flowering. To encourage branching and rejuvenate your plants’ vigour, pinch back plants. Deadhead spent flowers to prolong flowering. The tall group of Antirrhinum majus may need staking. Feed once monthly and lightly with a balanced organic fertiliser, one that provides healthy growth and flower production. Generally free from serious garden pests though watch out for aphids. 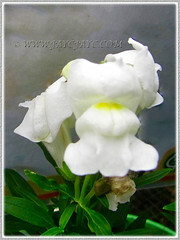 It is susceptible to mould, fungal leaf spots, downy mildew, wilt and root rots. Rust on plants can be a notable problem too – learn how to treat rust here. For subtropical and temperate regions: Hardiness: USDA Zone 4-11. Antirrhinum majus can tolerate frost and and light freeze if properly mulched or better still grow as an annual in a container and overwinter indoors during the cold weather. It can be grown in the winter for zones 9-11, outdoors as tender perennials. In zones 4-7, best to propagate by sowing seeds in spring after danger of frost has passed and give mulch if expecting a hard freeze or start them indoors 6-8 weeks before the expected last frost. However, in zones 8-11, sow seeds where they are to be grown in fall or winter. 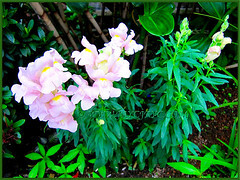 Garden Snapdragon will bloom from spring to fall. Propagation: By sowing seeds or tip cuttings. Seeds need light to germinate, so do not bury them but just sprinkle them on the soil surface and lightly press them down. Usage: Antirrhinum majus as ornamental plants will be ideal for garden beds, border edges, raised beds, front of herbaceous borders, rock gardens and window boxes. The short varies will suit these purposes. Perfect for mass plantings in above-ground planter with plants of various pastel colours and bright ones for contrast… will definitely be a knock-out in any landscape. These plants with showy flowers are suitable for container planting too. The tall group of A. majus plants are excellent to be grown as cut flowers. Particularly in Russia, the seeds have been used to extract edible oils. Also, the leaves and flowers have been considered to possess anti-inflammatory properties and have been used in poultices, plus a green dye has also been extracted from the flowers.